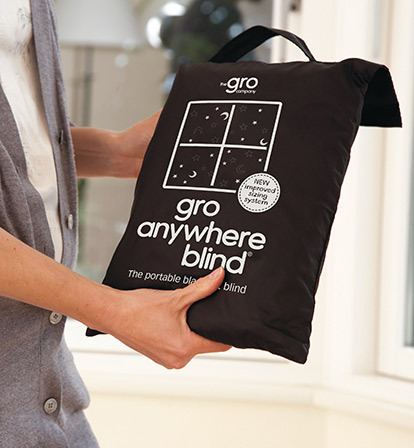 I recently purchased the “Gro Anywhere Blind” made by the Gro company. They are the makers of the “Gro bag” and other sleep related products like the “Gro clock.” I was looking for something that was easily portable and would truly darken the room. In addition to the travel aspect, we are moving yet again and it won’t be to a forever house. I just can’t invest in more permanent black out blinds at this point. I like that this little number adjusts to different sized windows and still does a pretty good job of making the room as dark as possible. The only downside is that it leaves behind suction marks on the window. Extra cleaning that I won’t get to until after all I deal with all the little greasy handprints on my walls. It was an expensive purchase but I’m happy to report that it got the job done. Recommended for travel! I didn’t mean to start this blog with a sleep related topic. It just kind of happened. The idea flowed from a few emails and a conversation that I had earlier last week. I thought it would be useful to do a follow-up post with sleep related resources that I am familiar with. In my therapy days, my sleep-related reading consisted of general sleep hygiene, the recommended/average amount of sleep infants and toddlers need, and basic sensory-based environmental strategies. In my parenting days, I have read and re-read these books and more, especially when my kids were/are in a “sleep challenging” period of time. 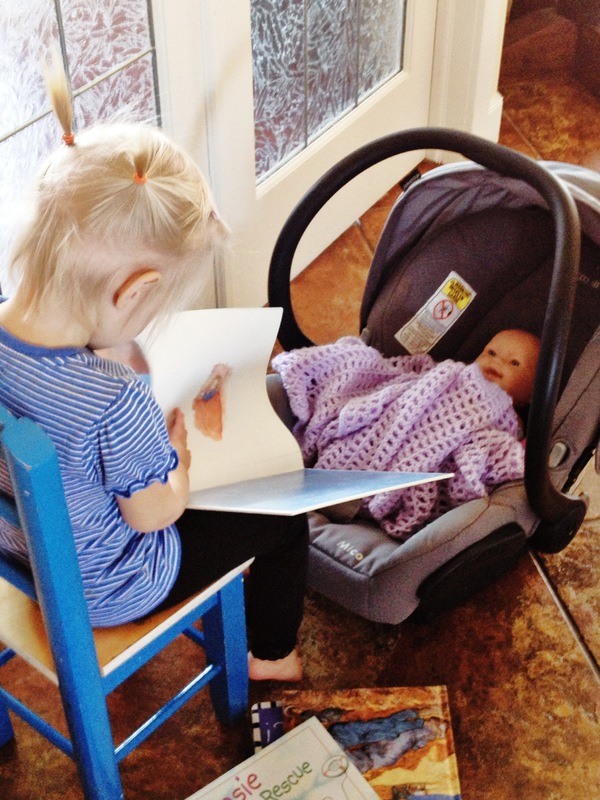 I also read because the sleep behaviour of my second baby was incredibly different than that of my first. What worked with the number one was an absolute no-go with number two. As you may have previously read, I’m still working on balancing my inner sleep schedule drill sergeant self (which for the record, has it’s place in the early days when you are establishing self soothing and sleep rhythms/routine/schedule, whatever you want to call it) and my go-with-the-flow, sleep-when-you-sleep hippy self. I had a conversation with friends the other night about the “right time” to receive sleep information. Pre-natal classes, for example, only scratch the surface of sleep-related issues. The morsel of sleep information takes a back seat to the “how to rock labour and delivery” information. At that point, pain management and effective pushing trumps how to teach a 4 month old to self-soothe. I’m not sure what the answer is. Regardless, I appreciate the birth of sleep consulting companies that are trying to address the need! Before I launch into resources, please consider seeing your doctor if your child snores, sleeps/breathes with an open mouth or has a nasally sounding voice. These are warning signs of medical conditions that need to be dealt with prior to attempting any sleep strategies. Healthy Sleep Habits, Healthy Child by Marc Weissbluth. This tends to be my go to book for sleep. The author presents a range of approaches instead of a cookie cutter model and the information spans newborn to adolescence. Quite honestly, I am biased towards this book because it is written by a paediatrician; as such, I trust that the information is based in science compared to something written by a non-health professional. The Sleep Lady’s Good Night Sleep Tight by Kim West. The author’s background is in social work. This isn’t an approach that worked for us but I can see it working for some babies. She uses the “Sleep Lady Shuffle” as the basis of her approach. 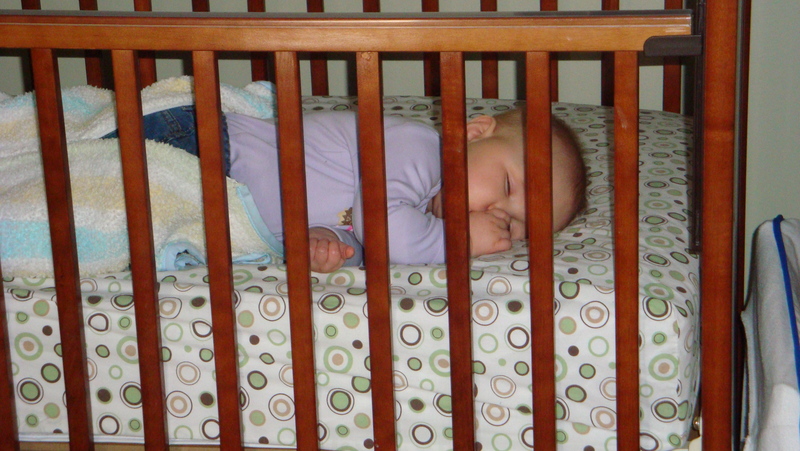 The staged “shuffle” is where a parent initially reassures and comforts the child seated next to the crib/bed. The chair is gradually moved farther away with each nap/bedtime. This is an oversimplification of the content of her book so keep in mind that it also includes good information on scheduling and routines. The No-Cry Sleep Solution by Elizabeth Pantley. The author’s website described her background as a parent educator and the owner of a family resource and education company. In thumbing through this book at Chapters, I always get stuck on the passage describing crying-it-out from a baby’s perspective. The vivid description of baby abandonment makes me feel like a terrible mother for letting my children cry at all so I haven’t been able to bring myself to buy it. There seemed to be an emphasis on completing sleep logs to assist with developing a plan of action and track progress. Sleep logs are beneficial to decide on the most appropriate strategy (or strategies) to implement. Nap and bedtime logs are available for download from her website. The Happiest Baby Guide to Great Sleep by Harvey Karp. Some information in this book overlaps with “The Happiest Baby on the Block” and “The Happiest Toddler on the Block”. The author covers a variety of approaches, some on the non-cry/sneaky side and some on the graduated cry-it-out side of the spectrum. He is a fervent supporter of swaddling, a strategy whose risk/benefit has come under question. In my opinion, going to a workshop is far better than reading. Logistics are more challenging; babysitters must be arranged, registration fees paid and schedules arranged. Reading in a sleep deprived, frustrated state is of little benefit for me. The result is either a puddle of tears or head bobbing with exhaustion. A workshop is far more stimulating. Plus it can be date night. Plus you realize how many people struggle with this. The ultimate service is an in-home consultation. If you are in crisis mode and can pay the cost, don’t think twice. It is money well spent. Sleep Dreams: This company is founded and run by an occupational therapist, Jennifer Garden. Clearly, I am biased towards this option because of my OT background. The benefit of hiring a sleep consultant with an occupational therapy background is their experience with sleep, feeding, sensory processing, toileting and motor skills. Plus, you may be able to claim the cost on your benefit plan! In home consultations are about $600 and include a home visit (1 – 1 1/2 h), appropriate assessments, a report with recommendations and follow up. Jennifer also runs workshops through Brilliant Beginnings (look under Parent Support/Parent Education). These workshops disseminate excellent info ration as well as allow opportunity for parents to ask questions. Check out her website and facebook page for sleep tips and information. Sleep Dream services will be expanding in the near future so keep your eye on their website. Jammy Time: I had not heard of this company before a few weeks ago and did a little digging earlier this week. The company was started in January 2013 by Shan Roth,whose previous career was in education, and is based on a program called Sleep Sense by Dana Obleman. Dana’s website states that she has a BA in psychology and an education degree. I don’t know much about the specifics of the program, but it sounds like Shan works with parents to provide an individualized plan tailored to their parenting style. Her in-home package costs about $500 and includes an hour home visit, a detailed sleep plan, 6 follow up phone calls in the first two weeks after implementation (each about 15 min in length), and one week of unlimited email support. Raymond Parenting: Kitty Raymond has worked in parent education for many years. She has a reputation for a stricter approach (some may call this closer to a cry-it-out approach). I do not have any direct experience with her programming so you will have to check out her site for yourself. Birth & Babies offers a “Sleep Workshop for Tired Parents” at cost of $40/couple. I have not attended this course in the past so can’t comment as to the content. Sleep Haven Sleep Consulting: run by an occupational therapist. Offers one-on-one consultation. Sleep Dreams: As above. Jennifer also provides services to Edmonton and area. Soothing Angels: run by a maternity and child sleep consultant with training in “Gentle Sleep Training” program by Kim West and another trademarked sleep certification. Offers in-home or phone consultation. 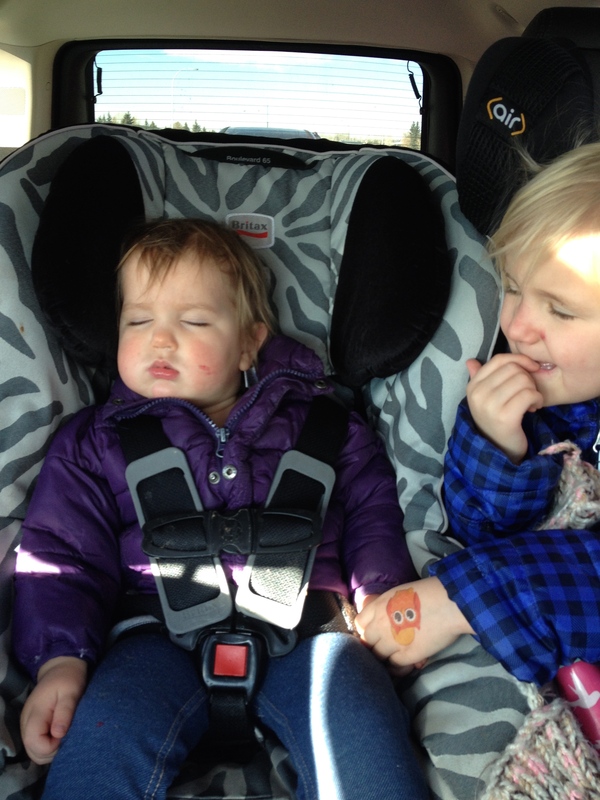 Sleep Matters: run by two pediatric physiotherapists and offers sleep classes. Do you know of any other services I have missed? Have you read books or other resources you can comment on? Have you read any of the books listed above and had a different opinion? Come on spring! We need some more vitamin D!! When am I a failure? I question myself all the time. And I can usually reason out both sides of a decision, leaving me hopelessly hesitant. I feel like I am constantly re-learning to trust my gut. Baby sleep is one of the areas that I keep re-learning the same freaking lesson….let it go when things don’t go as planned…. My second baby is a sleep fighter and a sleep crier. **I’m sorry Faye, you are such a happy, firey girl but when it comes to sleeping you have given me a run for my money. ** It’s hard for me to leave her cry (especially with a first baby who is a super cuddle bug, who only needs a quick cuddle to send her back to her coma land). Sleep is absolutely impossible for Faye if there is anything remotely interesting happening within earshot. She literally cries while sleeping. 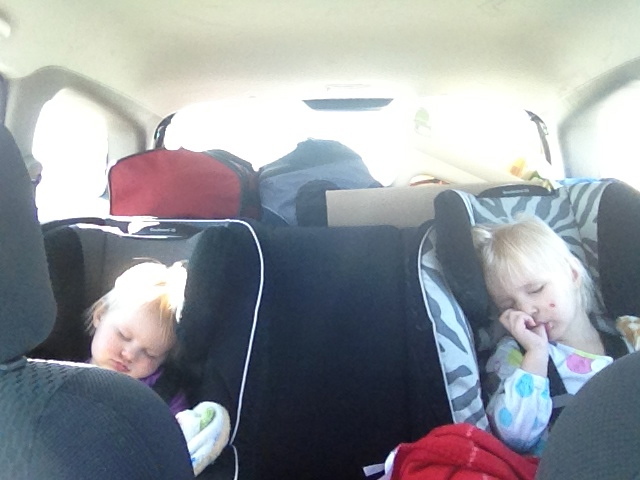 “Sleep crying”, a seemingly ridiculous term, has become commonplace in our home. It has taken us a year to accept this phenomenon. It’s ridiculous. Fortunately she has improved tremendously. Now she only cries out about twice a night, sometimes for a second and sometimes for 5 min. My husband (Ben) and I have had endless discussions on when to go in, how to go in, how to be consistent, how to comfort her, whether or not to nurse… and on and on. And I’ve read and re-read all of my go-to sleep resources. Ugh. She’s in the downsizing phase right now and it feels like it it is taking 10 years. Yet again, I question myself. What am I doing wrong to cause such short naps? In feeding therapy we often refer to the “Division of Responsibility.” We us this term, coined by a dietician, Ellyn Satter, to help parents understand their responsibility in the feeding relationship. Parents are to provide their babe/child with the what, when and where to eat. It is then the babe’s responsibility to decide how much to eat. When parents set their child up with ideal opportunities to eat, we hope giving that child responsibility to listen to her body will lead to a healthy eating relationship. We can’t force them to eat….. shoving a bottle into a baby’s mouth as she cries and turns away definitely does not create a positive eating environment. 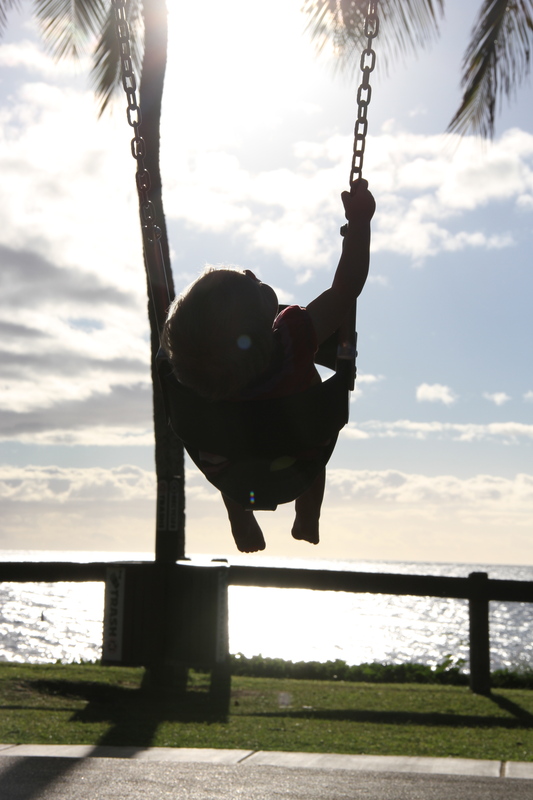 In the same vein, I need to be more realistic about sleep … I can’t make my child sleep. I need to set up her environment for sleeping. Then I need to provide her with regular opportunities to learn how to fall asleep on her own. I know this division of responsibility is simplified. The simple version takes reading the “I’m sleepy” cues out of the equation. My reflections are based on an older baby who has declared their cues and is in more of a two a day nap routine. The specific strategies and struggles of providing opportunities to learn to fall asleep alone at 3-ish months old is whole other post. I am trying to say that sleep is anything else, as parents our responsibility is 1) create the most ideal environment for our kids to thrive, and 2) try to equip them with the skills they need. I forget this too easily. If I find a time Faye is likely to be more sleepy, perform a calming bedtime routine, and get her all nice and cozy in the dark plus/minus white noise, I’ve done my job. I can provide regular opportunities to sleep in an environment that lends itself to sleep but she needs to actually do the job. I have to hand over the responsibility. Every time she doesn’t sleep as long as I think she should, I have to understand that it is not a personal failure. Ben says I should just take the “sleep stick” out of my arse … and he means it in the most loving way possible. I can get all bent out of shape when the kids don’t get as much sleep as I think they should. In my defence, I come by this fear honestly. I usually have to deal with the monstrous little people that sometimes result from prematurely terminated slumbers. Bottom line, I’m working on re-learning a balance of responsibility when it comes to sleep. I’ll get there. A couple of photos to make you smile…. 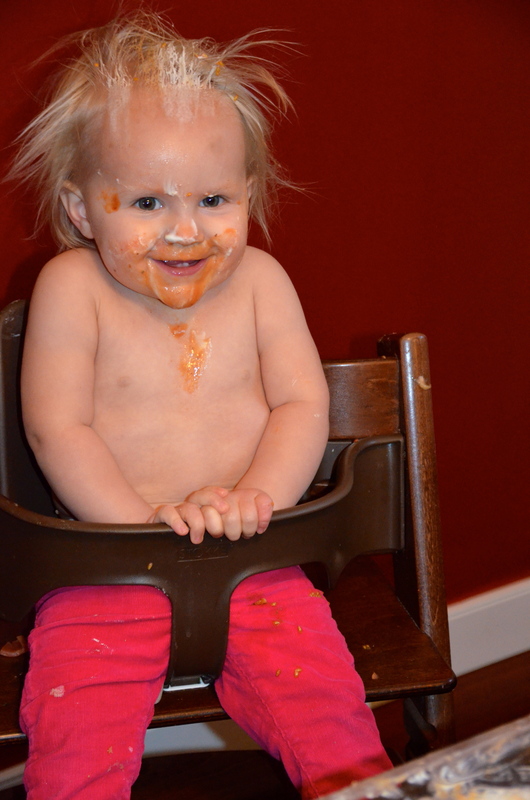 Dinner is messy at our house but not usually this bad!!! Doing a little mama-ing. Scene set up independently by El.